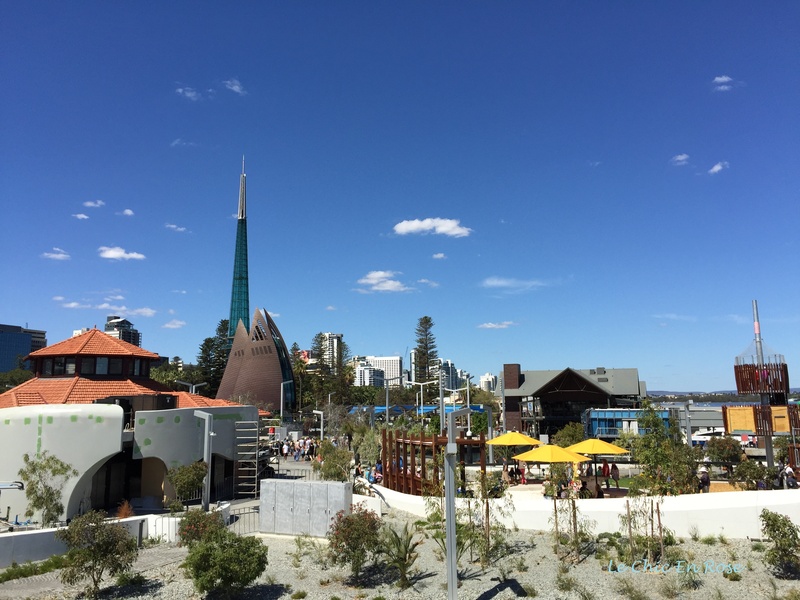 Elizabeth Quay is a new development in the heart of Perth by the Swan River, built with the intention of bringing the Esplanade area to life. Although blessed with a gorgeous setting on the river and popular with recreational cyclists, walkers and joggers, the area round the river front has been in many respects an underutilised resource for the city. Now backed with state funds (at times controversially but I’m not a politician so don’t intend to get involved in that debate! ), the ambitious project features boardwalks, cafes and restaurants. Excellent transport links by both train and river are designed to connect it with the city centre hub and the suburbs. 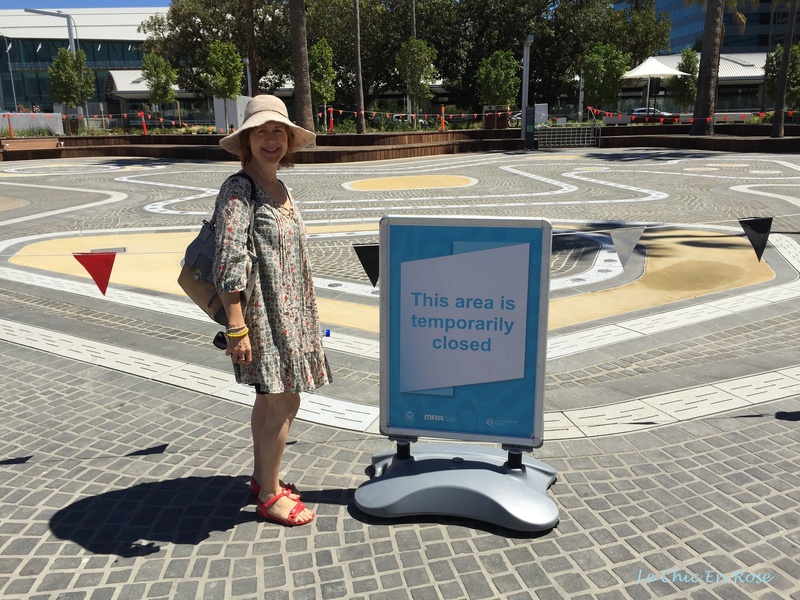 Elizabeth Quay was only officially opened at the end of January this year to coincide with the Perth International Arts Festival and Perth Fringe Festival. Having heard excellent reports from friends, we decided we should go down and check it out for ourselves. We’ve tended to only use public transport when we’ve been travelling abroad, but now we’re making a concerted effort to use the buses and trains more, especially when going into town. Getting off at the newly renamed Elizabeth Quay station (formerly Esplanade station), we found ourselves right by the Quay itself. Basically it’s a circular quay and we took a promenade around it admiring the views of the Swan River on one side and the impressive Perth City Centre on the other. 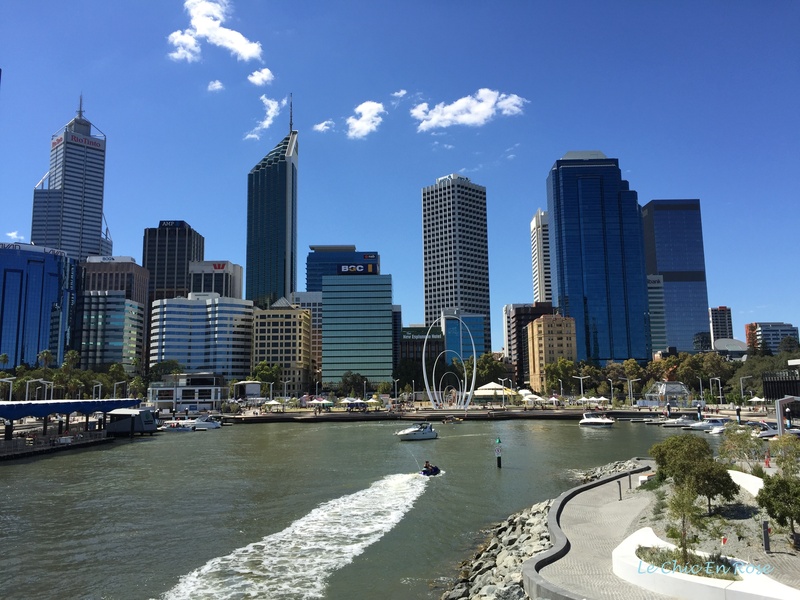 You haven’t been able to get such spectacular views of the city before without heading up to Kings Park or across the Swan to South Perth – the new development really opens the city up and showcases its superb riverside situation. 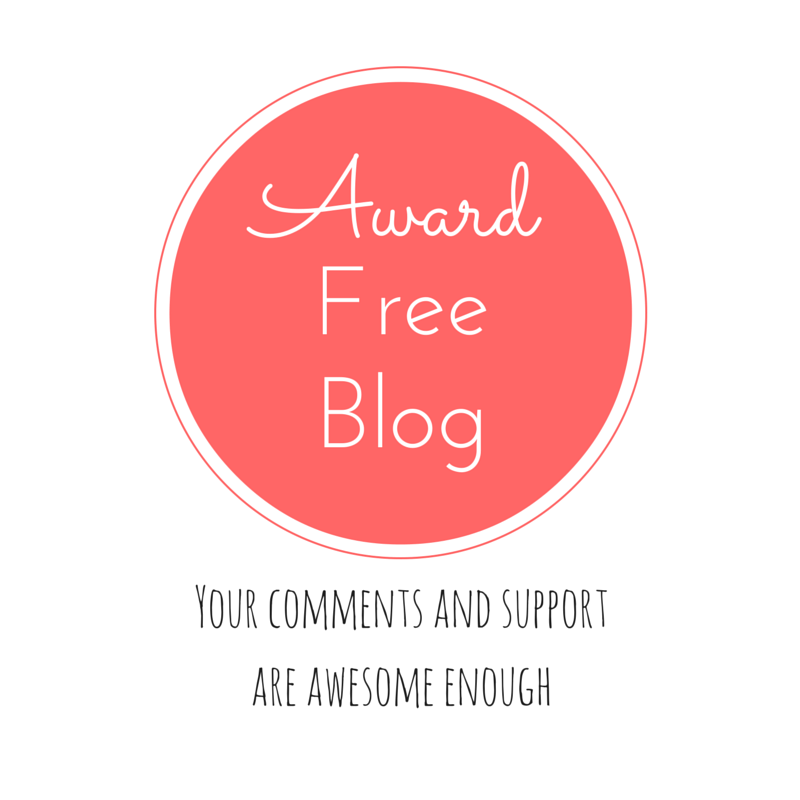 I should add it’s very much a work in progress. Only the walkways are complete and there is still a lot of building work going on. The water play area is currently closed owing to health and hygiene safety concerns (there have been suggestions to set up showers for patrons to use prior to entering the water zone!). A distinct lack of water at the water play area! Most of the cafes and eateries are still under construction and work will probably continue until 2108 according to some estimates. However finding refreshments is not a problem. The adjacent Barrack Street jetty area (next to the Bell Tower) has several cafes and watering holes and you are only a matter of minutes from Perth’s main thoroughfare (and business and shopping centre), St Georges Terrace. There was an attractive walk down by the river where you could watch the boats coming and going from the small man-made harbour. The best vantage point in our opinion was from the arched bridge – here you can enjoy a wonderful vista of central Perth. Sculpture at the end of the bridge – we think it’s a penguin! If you’re heading off to the Perth Zoo, the river ferry across the Swan now departs from Elizabeth Quay. The ferries down to Fremantle or up to the Swan Valley still go from nearby Barrack Street. After our walk round we headed off to find lunch at nearby Barrack Street – more about that next week! We thought this was a lovely part of your city, Rosemary. Love the funky bridge. The water park was working when we were there with several kids having great fun. Hope it doesn’t take too long for the whole concept to be completed. Wow – I love the look of the whole place Rosemary – those tall buildings glinting against the blue sky are just fabulous. What an exciting place to be able to visit, I’d love to be able to go back again and again and see how it changes. Sounds like there will be loads of great new restaurants and eateries to try out while it develops and grows too. Yes we were really impressed Joy as this is just the beginning really. I know that many cafes and restaurants have “booked” places in the new quayside area once it is complete. The Perth skyline is wonderful by day with the blue skies and also by night when it is all lit up. The location of the new quay is fabulous and we’ll be making many visits there in the years to come with family and friends! I’m pinching this for Monday, if that’s alright with you, Rosemay? That opening photo is fabulous and I love your bridge sequence too. 🙂 Wonderful to have such open space so near to the city. I think I’d love it there. Thanks, sweetheart! 🙂 It’s a quiet weekend here but I have the feeling I should be doing lots of stuff in preparation for the 2 ‘youngsters’ being home at Easter. Have a lovely time yourself! This reminds me of Brooklyn Bridge Park and how much they’ve transformed the area down by the Hudson River. Lots of park space, and a water park as well. Not as many restaurants, but funky food carts throughout. The bridge here looks awesome! I’m sure by 2018 it will look spectacular. I always love seeing the Brooklyn Bridge area in movies and television programmes! The park must be a wonderful resource too – I wonder if that was the model for the Perth one?! There are some food carts down by Elizabeth Quay too though as I say the plan is for more cafes and restaurants (and some apartments). The bridge is awesome – it was our favourite bit such great views! I think this is where my son gets the ferry to, what a fab way to get to work! Looks like it will be a lovely place once finished.